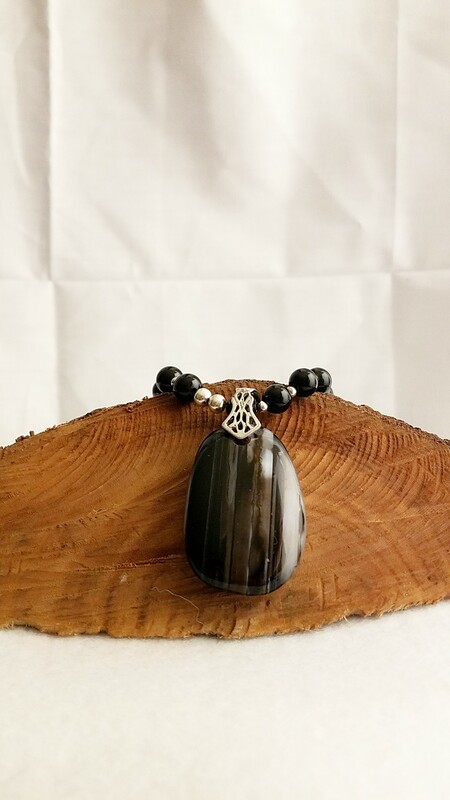 This Dazzling Black Agate Pendant Necklace is rich with color. This Dazzling Black Agate Pendant Necklace is rich with color. 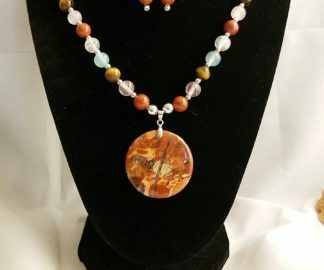 This Onyx necklace is complemented by a Dazzling Black Agate Pendant, which swirls with colors of creams and browns that are offset in a background of rich black. 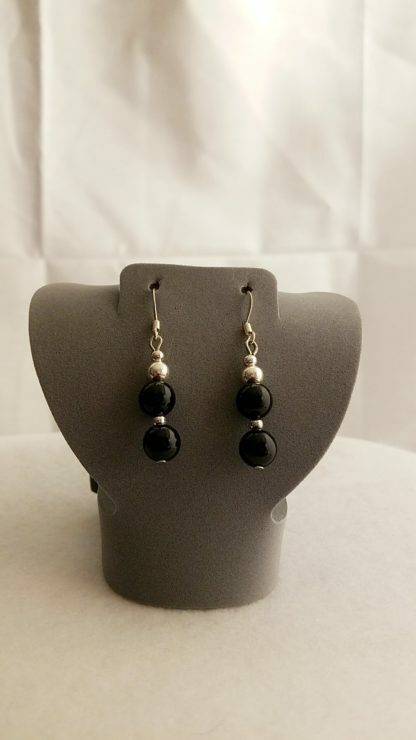 Not only that it comes with a complimentary set of matching earrings. Agate –is a variety of chalcedony formed from layers of quartz which usually show varicolored bands. It usually occurs as rounded nodules or veins. Often tiny quartz crystals form within the stone and add to the beauty and uniqueness of individual stones. These crystals are called druzy (sometimes misspelled as druzy). There are many colors and variants of agate. Black with white stripes – creates alertness. Onyx is a variety of chalcedony that is banded. The band colors range from white to just about any color except maybe purple or blue. Onyx is most known to contain bands of black and/or white. Onyx stone meaning for inner strength. It raises one’s resistance and persistence, enabling one to carry even unmanageable and tasks during to completion. On a mental level, it increases one’s power to keep focus, making it possible for one to take fighting new material and use well all that one has mastered. It quickly enhances the retention of memory and promotes attention to detail. These traits make Onyx an instructive instrument for pupils, teachers, business owners, accountants, lawyers, software and computer technicians, and all those whose work calls for high levels of focus, dedication, and discipline. However, Please Note: Crystal properties listed on this site are for information purposes. Always consult a physician for proper medical treatment. This unique item can’t be back ordered or custom ordered in a different color. 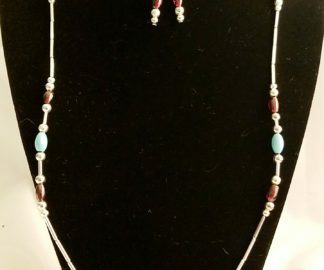 This is a piece that my Mother made. You will have a piece like no other person has. 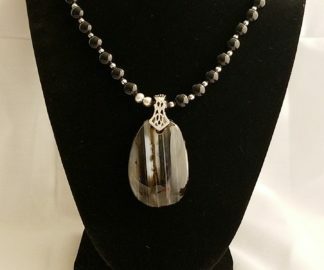 Therefore if you would like more information about the gemstones and items I use in making my handmade items like this, Dazzling Black Agate Pendant Necklace. Materials Description Page. 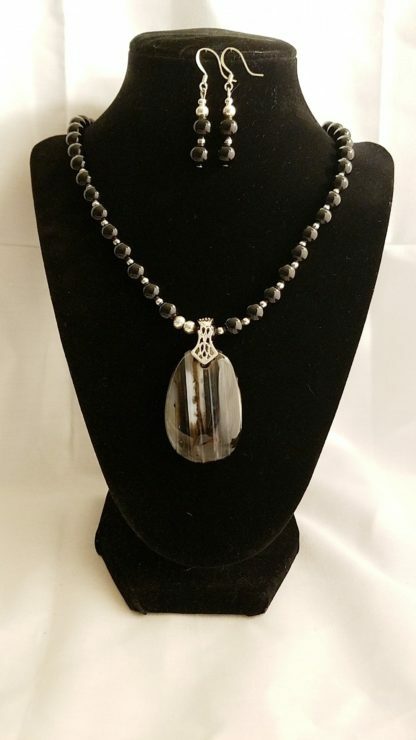 Let This Dazzling Black Agate Pendant Necklace give your wardrobe an exotic flair!